CEO David Holl aims to double revenue by revving up his sales force, expanding in international markets, and taking the cosmetics giant online. Shortly after 8 a.m. on a hot and muggy morning in late July, thousands of women jammed the foyer outside Hall A of the Dallas Convention Center. They were there for the Mary Kay Emerald Seminar, one of five consecutive three-day conventions the company holds each summer in Dallas. Inside the arena, rock music blared, a fog machine was pumping, and two dozen dancers filled the stage. Women in business attire began screaming like preteen girls at a Jonas Brothers concert. But they weren’t just excited about the song-and-dance on stage; they were on fire for Mary Kay. When he’s not igniting evangelistic fervor among the Mary Kay faithful, Holl maintains a low profile, despite having been at the helm of the multibillion-dollar company since 2006. When asked, many Dallas executives have a hard time recalling the name of Mary Kay’s CEO, incorrectly assuming the person at the top is Richard Rogers, son of the company’s late founder Mary Kay Ash. (Rogers serves as executive chairman.) More often, they assume the top officer is a woman. 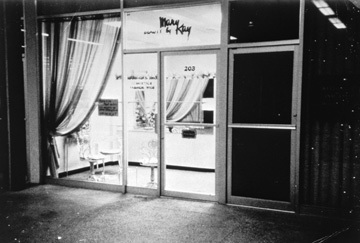 Founder Mary Kay Ash’s first store, which opened in 1963. photography courtesy of Mary Kay Inc. Looking back, Holl says he had no indication his career path would lead to the cosmetics empire. Born in 1960 in Decatur, Ill., the son of a lifelong General Electric employee, Holl and his four siblings grew up in New York and South Carolina. He went to Clemson University and graduate school at the University of South Carolina Moore School of Business. Then, in an attempt to flee the state and make some money, Holl took an oilfield job in Houston. He hated it. “After six months, I wanted to leave, but my dad was still working [at GE] and had been there for 38 years; he said, ‘Why don’t you give it a year?’ So I gave it 11 months before I left and came [to North Texas] to work for Citibank,” Holl says. He and his wife, Suzanne, lived in Dallas, then moved to New York before settling in Denver. In the early 1990s, Suzanne’s father became ill, and the Holls moved back to Dallas to be near him. During that time, an executive recruiter friend of Holl’s told him about an open finance position at Mary Kay. Holl knew of Mary Kay Inc. from his work as a banker—the cosmetics conglomerate had enjoyed a decent reputation after its $450 million leveraged buyout in 1985—and he learned about the strength of the company’s culture when he read one of Mary Kay Ash’s books, Mary Kay on People Management. But little did Holl know when reading that book that he’d one day take over the company Ash created. With only about 4,500 corporate employees worldwide, Mary Kay’s business model revolves around the work of its so-called “independent sales force,” which consists of an estimated 600,000 “independent beauty consultants” in North America and a total of 2 million consultants in more than 35 markets worldwide. In general terms, the tiered system begins with the beauty consultants on the bottom, then directors, and national sales directors. There are about 450 national sales directors worldwide. Beauty consultants typically hold parties where potential customers sample products. Because each consultant is in business for herself, she’s able to mark up Mary Kay products to whatever price point she chooses. Lipstick, for example, usually costs a consultant about $6, but the suggested retail price is $12, thus allowing Mary Kay corporate to say its sales team regularly makes a 50 percent commission. After beauty consultants “share the opportunity” with outsiders and transition them from customers into salespeople (commonly referred to as the consultant’s “offspring”), and when an undisclosed revenue point is reached, the consultant is on her way to becoming a director. It’s a complicated system, with specific requirements and rewards for each level. Some consultants may qualify for items like costume jewelry, whereas a national sales director may earn the right to drive a signature pink Cadillac Escalade (in what equates to a two-year lease paid by the company). It’s a business model that works: The consultants purchase the inventory directly from Mary Kay Inc., and the company doesn’t have to worry about carrying the costs of 2 million employees. Many of the company’s success stories come from women who pursued a career selling Mary Kay in an effort to support their families or create new lives for themselves. Karen Piro started selling Mary Kay in 1975 and rose through the ranks to become an independent executive national sales director (the “executive” comes from the fact that Piro helped several other members of her group achieve national sales director status). After Piro and her family relocated to Dallas 18 years ago, she continued to build her business. (Mary Kay does not give beauty consultants geographic boundaries, so it’s every woman for herself, anywhere in the country.) Piro has earned lifetime commissions totaling more than $10 million. The money is good, and a far cry from the salary she earned as a second-grade teacher in Iowa, but Piro says her job satisfaction comes from the leadership role she plays within her unit. After 35 years with Mary Kay, Piro maintains that Holl’s leadership is taking the business in the right direction. Bryce says Holl has a quiet, humble leadership style.